5. Department of Bioindustry Technology, Da-Yeh University, Datsuen, Changhua, Taiwan. Background: Heavy metal pollution in farm soils is a grave concern in Taiwan. Previously, we found the incidence of oral cancer (OC) correlated positively with levels of nickel and arsenic in farm soils. Many OC patients have a second malignancy, among which esophageal cancer (EC) is the most common one in Taiwan. Objectives: We aimed to investigate whether these two cancers share some common risk factors. Methods: Taiwan began a compulsory national health insurance program in 1995. We used a database from this program to calculate the prevalence of EC and OC in Taiwan. We compared the prevalence of EC with prevalence of betel nut chewers in adults and the information of heavy metal in farm soils to look for any association. Results: The prevalence of OC and prevalence of EC were strongly correlated. The prevalence of betel nut chewing correlated with OC prevalence, but not with EC prevalence. An increased prevalence (1.9 fold) of EC was found where the farm soils contained high levels of nickel. Meanwhile, among the eight heavy metals studied, only the levels of nickel in the farm soils correlated statistically with the prevalence of EC. Conclusion: Nickel is probably a common environmental risk factor for esophageal cancer and oral cancer. Keywords: esophageal cancer, oral cancer, nickel, prevalence, soils. Nickel is an essential metal used in many industries, including electroplating. Many studies have examined the health hazards associated with nickel exposure among workers in factories where nickel is used . Based on results from these studies, the International Agency for Research on Cancer (IARC) has concluded that exposure to nickel is associated with an increased risk of lung cancer and sinonasal cancer . Heavy metal pollution in farm soils is a grave problem in Taiwan. From 1982 to 2002, the government carried out several nation-wide surveys to measure the levels of heavy metals in farm soils . Because nearly all industries in Taiwan are located along the west coast of the island, these surveys also focused on farm soils in the west coast; therefore, this study did not include areas in the east coast of Taiwan. Changhua, a county in central Taiwan, is a hub for electroplating industries. Heavy metal pollution in local farm soils is already documented. Previously, we found Changhua had the highest incidence of OC in Taiwan . OC patients who were living in the area with a higher density of electroplating factories had their disease diagnosed at a younger age and suffered from a poorer prognosis . In addition, the incidence of OC was statistically associated with the levels of nickel and arsenic in the farm soils . Moreover, OC patients had higher blood levels of nickel than controls . Other researchers in Taiwan also found evidence that people living in these heavily polluted townships in Changhua had higher urine levels of nickel than people living in non-polluted townships . Furthermore, ten years after local farm soil pollution with heavy metal became a great concern; the incidence of oral cancer in Changhua began to skyrocket, leaving the incidence of oral cancer in the rest regions in Taiwan far behind . Because OC is one of the leading malignancies in Taiwan, the government has conducted an OC screening project for the public. As a result, many OC patients were diagnosed at an early stage and had a better prognosis than those diagnosed at a late stage. Along with the better prognosis for OC patients in Taiwan, we have observed that many OC patients at Changhua had a second tumor, among which EC is the most common one. These patients usually died within one year of the diagnosis of EC because the cancer was diagnosed at a late stage. To improve the prognosis for these patients, we need to diagnose EC at an early stage. However, to perform esophageal endoscopy for persons without any symptoms, we need evidence to persuade the government and the public. Key research questions are whether, how, and to what degree these two cancers may be associated and what, if any, common risk factors do these two cancers share. Taiwan began its compulsory national health insurance (NHI) program in 1995. More than 95% of the medical institutes in Taiwan are contracted with the NHI, and more than 99% of the population is covered by the program. This database gives us an opportunity to study the relationships between EC and OC, and answer the questions raised above. Taiwan began a compulsory health insurance program for all in 1995. The data produced from this program are managed by the National Health Research Institute of Taiwan and form the National Health Insurance Research Database (NHIRD), which provides detailed demographic data regarding healthcare services for outpatient visits, hospitalizations, prescriptions, and place of registration. We used a database from NHIRD which contains a sample of one million Taiwanese residents (>4% of the total population) randomly selected from the NHIRD for this study. A patient with EC (ICD9 code 150) or OC (ICD9 code 140-146) is defined by a diagnosis of the disease with a positive pathology report. Standardization of the prevalence was based on year 2000 world standard population by the World Health Organization (WHO). The prevalence rates of betel nut chewers and smokers in adults were retrieved from a report by Health Promotion Administration, Ministry of Health and Welfare . Although address of an insured individual is not available in this Database, the location of the hospital visited and of the insurance registration are available. To understand the residence of each individual, we decided the place-of-residence of each individual at the county level based on the location of hospital or clinic visited for common cold and/or dental diseases. If not available, the location of registration is defined as the place-of-residence. Heavy metal concentrations in the surface (0~15 cm) of farm soils were retrieved from national surveys , which include the following eight metals: arsenic (As), mercury (Hg), cadmium (Cd), chromium (Cr), copper (Cu), nickel (Ni), lead (Pb), and zinc (Zn). The total concentrations of extractable As and Hg in the soils were measured with the aqua regia method, and the concentrations of the other six kinds of heavy metals were obtained with the 0.1 N HCl extraction method. By averaging the results of different samples within the same township/precinct, we obtained a value to represent the metal concentration for each township/precinct. Furthermore, we divided the west coast into 12 areas, based the administrative areas and major industrial types. For a certain area, we added all the representative values for each township/precinct and divided the sum with the number of township/precinct in the area to obtain a representative value for the area. The Moran index (Moran's I), which is a measure of spatial autocorrelation at global scale, is used to estimate the magnitude of spatial association among all locations within the study area. Moran's I statistic ranges from -1 to 1, and it equals 0 when there is no spatial autocorrelation relation. Positive values of Moran's I statistics suggest spatial clustering, while negative values suggest dispersion. The spatial lag model (SLM) regression can incorporate spatial dependence into the classical regression model. The SLM adds an additional predictor in the form of a spatially lagged exogenous variable to explain spatial dependence. The exploratory spatial data analyses and spatial regression were carried out using statistical computing software. For all statistical inferences, the significance was tested at a significance level of 0.05. Age distribution and prevalence of EC in Taiwan are shown in Figure 1a. There were 209 persons diagnosed with EC in 2010 in our database containing information from one million people. The prevalence of EC was 20.9 per one hundred thousand persons; Nine tenths of the patients were men, and 10% of them were women. The age distribution (Figure 1a) shows that more than half of the patients were in their fifties and sixties. The mean age at diagnosis was 61.58; the oldest, 93, and the youngest, 34. The age distribution of the population is also shown for comparison. Death toll by EC was 656 in 1994, 1660 in 2013 (Figure 1b), a 2.5 fold increase in two decades. For the numbers of new EC patients, it was 1369 in 2003, 2496 in 2013, a 1.9 fold increase in one decade. According to the government report, EC is the leading cancer with the highest percent increase in cancer mortality in recent years . We compared the prevalence of EC, OC, and frequency of betel nut chewers in adults  in different areas of Taiwan (Table 1). For the prevalence of EC, it varied from 12.34 per one hundred thousand persons at Miaoli to 39.12 at Changhua. The top three areas were Changhua, Taichung, and Nantou. For the prevalence of OC, it ranged from 63 per one hundred thousand persons at Miaoli to 175 at Changhua. The prevalence of betel nut chewers in adults for each area is also listed in the Table. It ranged from 5 to 12 per one hundred persons. As shown in Figure 2, there is a significant correlation between the prevalence of OC and EC in Taiwan. This may indicate that these two cancers share some common risk factors. Because betel nut chewing is the most important risk factor for OC in Taiwan , we were interested in whether it is also a risk factor for EC. As expected, there is a significant correlation between the prevalence of OC and prevalence of betel nut chewers. However, there is no correlation between the prevalence of betel nut chewers and prevalence of EC. These results imply that the prevalence of EC and OC in Taiwan are closely correlated, and betel nut chewing is unlikely a common risk factor to explain such a correlation. Age-standardized prevalence rate of esophageal cancer (EC), oral cancer (OC), and prevalence of betel nut chewers (BNC) in each area of Taiwan. The unit for EC and OC is per one hundred thousand persons, for betel nut chewers per one hundred adults. 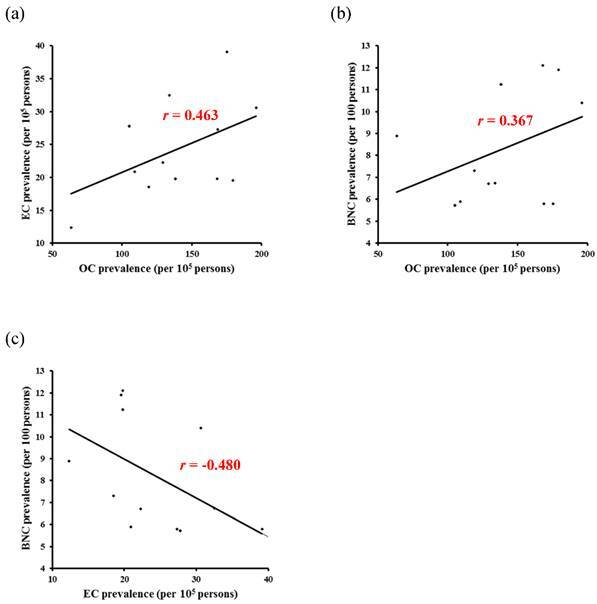 Scatter plots and r values for prevalences of EC & OC (a), OC & BNC (b), and EC and BNC (c). For abbreviations: EC, esophageal cancer; OC, oral cancer; BNC, betel nut chewers. We used Global Moran's I to determine the spatial autocorrelation of heavy metal levels in farm soils. The results (Table 2) show 5 heavy metals (As, Cu, Ni, Pb, Zn) were statistically significant (p < 0.05). We then used the Spatial Lag Models to study the relationships between prevalence of EC and these 5 heavy metals, in addition to prevalence of smoking or betel nut chewing. The results (Table 3) show only nickel (Ni) is positively associated with the EC prevalence. Subsequently, we used the standard β of spatial lag regression model to evaluate the rank of these associated factors. The standard β for nickel (Ni) is the largest. According to these results, we suspected Ni might be an important risk factor of esophageal cancer in Taiwan. We used different colors to show the EC prevalence in different areas of Taiwan. The levels of nickel or arsenic in farm soils at the township's level are also shown in maps for comparison (Figure 3). The townships with high nickel levels in farm soils are located in Taichung and Changhua. In addition, the top three areas in the list of EC prevalence are Taichung, Changhua, and Nantou. (a) map for prevalence of esophageal cancer; (b) map for nickel levels (mg/kg) in farm soils; (c) map for arsenic levels (mg/kg) in farm soils. For abbreviations in a: HH denotes hot spots; LL denotes cold spots; HL denotes regions with above average values surrounded by regions with below average values, and LH denotes regions with below average values surrounded by regions with above average values. Global Moran's I for heavy metals. Regression results of the EC prevalence, heavy metals and risk factors in Taiwan. We provide evidence that there is an increased prevalence of esophageal cancer in areas with high nickel levels in farm soils, compared with areas with low levels. In addition, the top three areas in EC prevalence are located around the areas with high levels of nickel in farm soils. The study came from our observation that many OC patients in Changhua died of EC (unpublished). We were curious whether the prevalence of EC and OC are correlated in Taiwan. The results from the study confirm our suspicion. It is thus reasonable to assume there are common risk factors for these two cancers in Taiwan. Betel nut chewing is known to be the most important risk factor for OC in Taiwan [12, 13]. We were interested in whether it is also a risk factor for EC. As expected, there is significant correlation between the prevalence of OC and the prevalence of betel nut chewers. In contrast, there is no such correlation between the prevalence of esophageal cancer and the prevalence of betel nut chewers. These results imply that betel nut chewing is an unlikely common risk factor for these two cancers. There may be other factors to explain the correlation. Previously, we found oral cancer patients who were living in areas with a higher density of electroplating factories had their disease diagnosed at a younger age and suffered from a poorer prognosis. Moreover, the incidence of oral cancer was statistically associated with the levels of nickel and arsenic in the farm soils. Because arsenic is not a pollutant in local farm soils in Taichung, Changhua, or Nantou (Figure 3), we suspected nickel may be a more likely candidate. In a regression analysis including heavy metals and risk factors like smoking and betel nut chewing, nickel is the most significant factor with good correlation with the prevalence of EC in Taiwan. Taichung and Changhua had the highest levels of nickel in farm soils. In contrast, the soil levels of nickel in Nantou were not high. However, Nantou has many high mountains and limited farmland. As a result, Nantou has to import many farm products from Taichung and Changhua. In short, people in these three leading counties depend on agricultural products from farmlands polluted with nickel. We also noted relatively higher prevalence of EC and OC, but lower BNC in Hsinchu and Kaohsiung. The nickel level (mg/kg) in farm soils at Hsinchu was 6.39, in the highest quartile, 1.3 at Kaohsiung, a value below the average. Kaohsiung used to be a hub for petrochemical industries. More studies are needed to explain why Kaohsiung had a high prevalence of EC and OC. The IARC has concluded that exposure to nickel is associated with an increased risk of lung cancer and sinonasal cancer. Esophageal cancer is not considered by IARC as a malignancy associated with an increased exposure to nickel. We understand IARC needs more evidence to include EC in the list of malignancies associated with nickel. There are not yet many papers addressing nickel exposure and EC in the literature. A cohort study conducted on a total of 432, 526 workers in the largest nickel production enterprise in China found malignancies were the primary cause of death, accounting for 36.6% of total deaths for these workers. Esophageal cancer was the fourth common malignancy, next to the lung cancer, stomach cancer, and liver cancer . Nickel can disrupt histone structures in the genome, indicating that nickel is able to alter gene expression, resulting in functional or structural changes in the cell , which can put cells under risk of malignant transformation. There are some limitations to this report. First, we did not include the incidence of EC in the report. Based on our database containing one million people, there were only 35 newly diagnosed EC patients in 2011. In comparison, 28 patients passed away in 2011. The number is too low for further analysis in the 12 areas of Taiwan. We also did not differentiate pathological types in the EC patients. Taiwan is different from most western countries where adenocarcinoma is the major type of EC. In contrast, more than 95% of EC patients had squamous cell carcinoma in Taiwan . Previously, we did a study to confirm that levels of certain heavy metals including nickel were higher in OC patients than in controls . To prove nickel is a risk factor for EC, we need to do a similar study on EC patients. 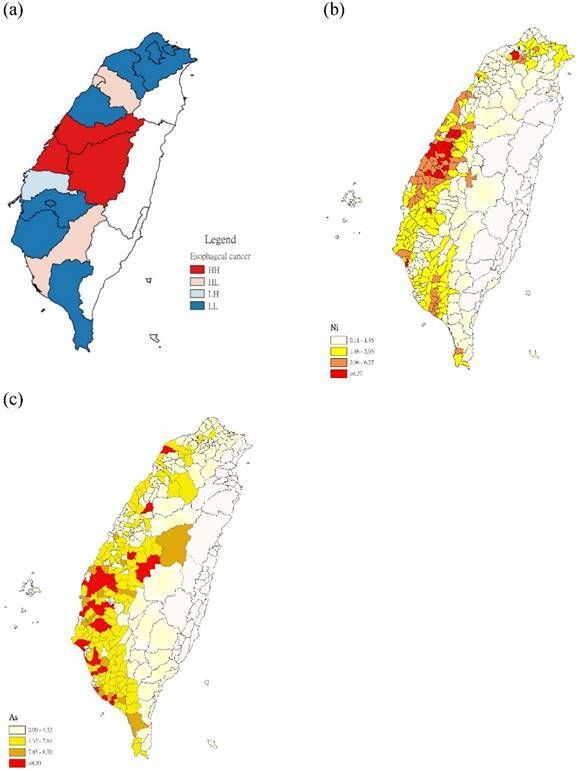 The study found farm soil levels of nickel are associated with an increased prevalence of EC in Taiwan. The top three leading counties in EC prevalence are located around an area where farm soils are contaminated with nickel. Nickel is probably an important risk factor for EC in Taiwan and a common risk factor for EC and OC. We thank Dr. Susan Olmstead-Wang at the Johns Hopkins University for her help in editing the manuscript. This study was supported by a grant from Changhua Christian Hospital (101-CCH-ICO-003). The authors have no actual or potential competing financial interests. 11. Taiwan Cancer Registry. Statistics of causes of death. http://tcr.cph.ntu.edu.tw. Corresponding author: Che-Chun Su, Department of Internal Medicine, Changhua Christian Hospital, 135, Nan-Hsiao Street, Changhua 500, Taiwan; E-mail:115025org.tw. Tel: 886-4-22031830.